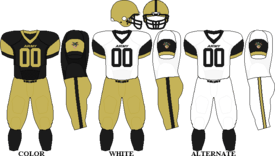 The Army Black Knights football team represents the United States Military Academy in college football. Army is currently a Division I Football Bowl Subdivision (FBS) member of the NCAA. The Black Knights currently play their home games in West Point, New York at Michie Stadium, with a capacity of 38,000. Army is currently coached by Jeff Monken who is in his 3rd season as head coach. Army is a three time national champion, winning the title in 1944, 1945, and 1946. 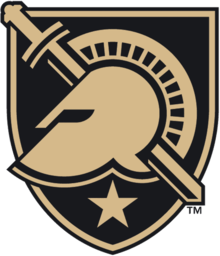 With the exception of seven seasons (1998-2004) where the team was a member of Conference USA, Army has competed as an independent, meaning that they have no affiliation with any conference. Currently, Army is one of four schools in the FBS that does not belong to any conference; the other three being BYU, Notre Dame, and UMass. However, all four of these schools belong to conferences for all other sports. Army is primarily a member of the Patriot League, BYU is a member of the West Coast Conference, Notre Dame belongs to the Atlantic Coast Conference, and UMass belongs to the Atlantic 10 Conference. Army's football program began on November 29, 1890, when Navy challenged the cadets to a game of the relatively new sport. Navy defeated Army at West Point that year, but Army avenged the loss in Annapolis the following year. The academies still clash every December in what is traditionally the last regular-season Division I college-football game. The 2015 Army-Navy Game marked Army's fourteenth consecutive loss to Navy. From 1944 to 1950, the Cadets / Black Knights / the Corps had 57 wins, 3 losses and 4 ties. During this time span, Army won three national championships. The football team plays its home games at Michie Stadium, where the playing field is named after Earl Blaik. Cadets' attendance is mandatory at football games and the Corps stands for the duration of the game. At all home games, one of the four regiments marches onto the field in formation before the team takes the field and leads the crowd in traditional Army cheers. Air Force, Army, and Navy have played each other every year since 1972 for the Commander-in Chief's Trophy. Air Force leads the FBS service academies with 19 victories, Navy has 15 victories, Army has 6 victories, and the trophy has been shared 4 times. Air Force and Army meet annually during the Commander-in-Chief's Trophy every year. Air Force leads Army 35-14-1 in overall meetings, and 32-12 in the Trophy series. Army and Navy play each other annually in the Army-Navy game, which is also a part of the Commander-in-Chief's Trophy. This series is one of the oldest and traditional rivalries in the NCAA. They first met in 1890, and have played each other annually since 1930. The games are generally played at a neutral site. Navy leads the series 60-49-7. Notre Dame is a rivalry which has fallen into obscurity. In much of the early 20th century, Army and Notre Dame were considered football powerhouses, and met 34 times between 1913 and 1947. Though the rivalry has slowed down they last met in 2010 and will be meeting again in 2016. Notre Dame leads the series 38-8-4. Many media members considered the 1946 contest to be the "Game of the Century". This rivalry stems from 1891 with Army and Rutgers being two of the only three programs (a third is Navy) to come out of the original, informal "Ivy League" that are still members of the NCAA Division I FBS). ("See" Before There Was An Ivy League "and" Ivy League#History of the athletic league.) Army is Rutgers' second oldest active rivalry. Rutgers and Army has met 40 times since 1891 and Rutgers leads the series 22-18. Tucker Waugh was the wide receivers coach at Army from 2000-2004. Charles Dudley Daly coached did not coach the 1917-1918 seasons. Army has won 3 national championships, two from the AP and one from Helms Athletic Foundation. President of the United States and General of the Army Dwight D. Eisenhower and General of the Army Omar Bradley were on the 1912 Army football team. Eisenhower was injured and his football career was over by 1913, when the two future generals were juniors. Bradley, a star of the Army baseball team for four years, was on the field in 1913 when Notre Dame upset Army in an historic college football game in which the forward pass was used for the first time. Bradley played end opposite the legendary Knute Rockne, the Notre Dame end who later coached the Irish to national championships before dying in a plane crash near Bazaar, Kansas, on Easter Friday in 1931. ↑ "USMA Publication Standards Manual Style Guide" (PDF). 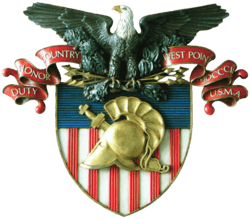 United States Military Academy–West Point. 2015-10-02. Retrieved 2016-04-07. ↑ "Heisman Winners". The Heisman Trophy. Archived from the original on December 9, 2007. Retrieved 4 November 2012. ↑ Ambrose (1966), pp. 305–306. ↑ "Trophy Winners". The Heisman Trophy. Archived from the original on December 18, 2008. Retrieved 31 December 2008. ↑ "Biography". Official Website of Vince Lombardi. Archived from the original on 30 December 2008. Retrieved 31 December 2008. ↑ Biggane, Brian (15 November 2008). "Bill Parcells is Dolphins' Godfather". Palm Beach Post. Retrieved 25 January 2009. ↑ Palka (2008), p. 197. ↑ "Army Football to Leave Conference USA After 2004 Season". The Official Website of Conference USA. Retrieved 23 January 2009. ↑ "> Alma Mater & Fight Songs". Army West Point website. ↑ "> Army Mules". Army West Point website. ↑ Notre Dame-Army Rivalry Renews in 2010 As First Football Game at Yankee Stadium, University of Notre Dame, retrieved August 26, 2010. ↑ Boston College Even with Irish in Yardage, Pittsburgh Post-Gazette, November 13, 1946. ↑ 2013 Army football media guide. Retrieved 2013-Oct-15.